The railways in Japan are the country’s most popular form of transportation, used both within metropolitan areas and between towns and cities. The majority of overground rail lines in Japan were owned by the nationalised body Japan National Railways until 1987. Since then, the passenger services on these lines have been operated by six regional companies – JR Hokkaido, JR East, JR Central, JR West, JR Shikoku and JR Kyūshū, which together form the Japan Railways Group. In addition to regular inner-city and intercity lines, JR operates all of the country’s Shinkansen high speed rail lines, and are currently working on a Maglev train link between Tokyo and Nagoya. Tests of this service broke the world record for fastest train in April 2015. In addition to JR, there are 16 major rail companies operating passenger services in the country. While some of these services follow similar routes to JR lines, many of them serve areas where there is no JR line. 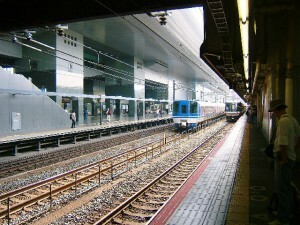 While travelling around Japan, it is common to use a variety of different rail companies to get where you need to go. Most rail tickets can be bought at machines by the ticket gate that usually have English guidance. If you buy the wrong priced ticket for your journey, you can use a Fare Adjustment machine at the end of your journey, that will allow you to pay the difference, or will refund you the difference, and issue a new ticket for you to put through the exit barrier. To save time it is common to use rechargeable smart cards to pay for rail journeys. These cards, including Suica, Pasmo and Icoca, can be topped up at stations and used on multiple rail networks. The card is passed over a sensor at the ticket barrier and your total journey cost is deducted at the end. Some rail services may offer a slight discount for using these cards over paper tickets. Increasingly they can also be accepted as payment at Convenience Stores and even some drinks vending machines. Basic rail fares are charged according to total distance travelled. Fares vary slightly from company to company. If you have to switch between the lines of two or more different companies, you will be charged separately for each part of the journey. You will find it cheapest, where possible, to make your whole journey on a single company’s rail lines. Journeys on express trains and Shinkansen typically incur an additional fee which depends on the kind of seat booked. An unreserved seat is cheapest, and allows you to sit in any unoccupied seat in one of the unreserved carriages. Reserved seat tickets allocate you a specific seat. Many Shinkansen services also have Green Cars, which are similar to first-class, and may offer such extras as heated seats and access to power outlets. While there are many day passes offering unlimited travel on rail services in various cities, ticket prices between cities is typically fixed, with no special discounts for advanced booking.